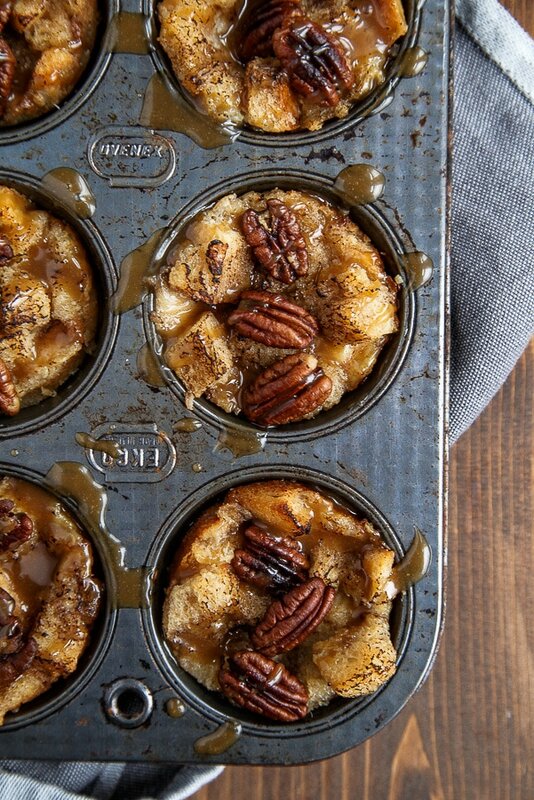 Mini bread puddings in a muffin pan. With whiskey sauce. I feel like the first thing we need to talk about today is that sauce. I’m going to say the name of it, but I want you to be sitting down first. Ok, are you ready? Brown sugar whiskey caramel sauce. I know. Just roll me out of here when I’m done bathing in it. The mini bread puddings underneath the sauce are just as incredible. They have a slightly crusty top, but are incredibly moist inside. When they come out of the oven, they’re super puffy and golden brown. Though, they do deflate after a few minutes, they’re still just as delicious. I couldn’t decide how many of these I could eat–two or three? So, I made six. That’s three for you, three for me. Or, we could do two for you, two for me and two for the dog? Actually, I don’t recommend that. Save the extras for breakfast the next day. Pudding for breakfast is just plain healthy if you ask me. And only if you ask me and not a nutritionist. 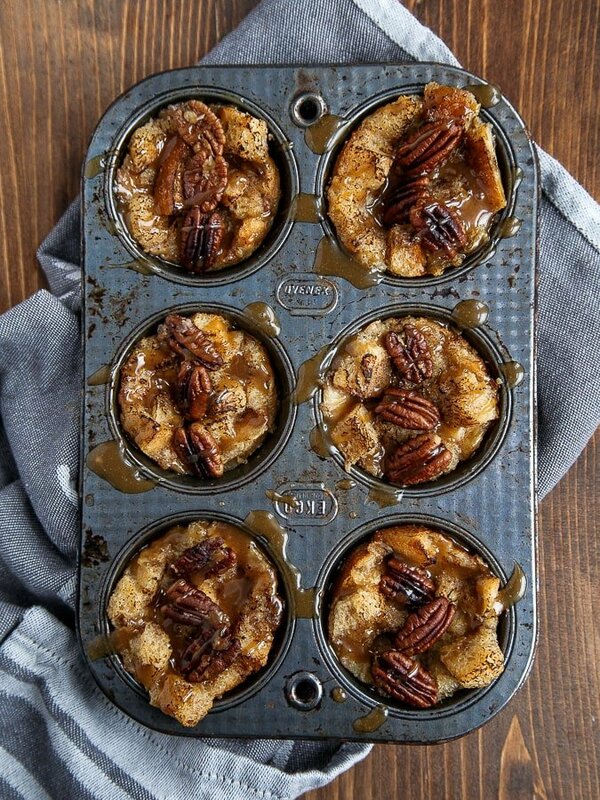 The buttery little pecans on top of these mini bread puddings are the best part (after the sauce, of course). I love peppermint, eggnog, and all of the usual holiday flavors this time of year, but I have to say that buttered pecan is the quintessential holiday aroma for me. The smell, the taste, the guessing game of burning a few nuts to get that extra toasty flavor? Fun, right? Check my how to video above for tips & tricks on toasting nuts! I thought I’d let you know that you can feel free to double, triple or even quadruple this recipe if you’re serving a crowd. But please mind the egg ratios: don’t get lazy and add a whole egg instead of the extra egg yolk, ok? Scale up responsibly, friends! In a small skillet, add one tablespoon of the butter and turn the heat to medium-low. Add the pecans when the butter melts, and toast gently until fragrant and beginning to darken in several places. Remove from heat and pour into a bowl immediately to stop the cooking process. Preheat the oven to 325, and grease 6 cups of a muffin pan with oil or cooking spray. Melt the remaining 2 tablespoons of butter in a medium bowl. Whisk in the milk, cream, sugar, cinnamon, nutmeg, vanilla and almond extract. Don't be tempted to skip the almond extract; it's pivotal here. If you're out, though, use an extra bump of vanilla in its place. Finally, stir in the egg and egg yolk (reserve the egg white for another use. I have an index of uses here). Add the bread cubes, stir and let sit for 5 minutes. Divide the bread cubes between the 6 muffin cups, not worrying so much about the liquid. After all of the bread is divided, even out the amount of liquid between the cups--it should fill about three-fourths of the way in each cup. Bake the bread puddings for 20 minutes. 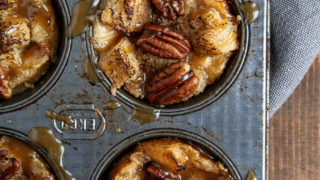 After 20 minutes, scatter the pecans and any excess butter on top, and return the bread puddings to the oven for another 7-10 minutes. Let the puddings cool in the pan for 10 minutes before moving with a knife. While the puddings cool, make the sauce: bring the brown sugar and heavy cream in a small saucepan or butter warmer. Bring to a boil and cook for 2 minutes. Remove from the heat, and stir in the whiskey. Drizzle the sauce over the bread pudding sand serve. A small batch of Croissants! Oh! Naughty, but sounds delish! Wonder if I can use White Rum instead of the whiskey though? Don’t have any Whiskey…..
I’m a sucker for mini anything but especially bread pudding! Yummy! Dear Lord, I need these. Like right now for breakfast. And then more for dessert tonight. With lots and lots and lots of pecans. Did you know that my great-grandfather had a pecan orchard? Every year, Ma-Ma would go down all of November and come back with pillowcases full of shelled pecans for the winter. So, everything had a nice amount of pecans in it. All of her recipes just list “pecans” as an ingredient with no measurements. That means add some handfuls. Yes. I never follow quantity directions when it comes to adding pecans. Always add more. The end. Did you know that bread pudding is the favorite dessert around here? And that anything with nuts is a guaranteed hit for Mr. non-sweet tooth? Basically, our house just gained 5 pounds, no regrets. Thanks!!! Say the name of that sauce again, please. Oh wait, did that sound dirty? GOOD! Ha ha ha. This is amazing. Love it and love you! Happy Friday. I prefer my bottoms saucy and boozed up, too. Okay, I don’t know what that means, it’s still early here and I’m still working on cup of coffee #2. Point it, I want all that whiskey caramel sauce in my face…or coffee now that I think about it….Pudding for breakfast? Don’t mind if I do! Have a great weekend, m’dear! My family loves bread pudding for Christmas morning brunch, this one looks yummy! Um. WOW! That’s the kinda sauce I’d like to bathe in. And inhale a few of those gorgeous minis at the same time! Get me a straw for that sauce! Love these! Last time I made bread pudding it was sitting around begging me to eat it for days! This would be the perfect amount + they look so delicious! I want three! I want three! Some flavors are just meant to be together, like bourbon and buttered pecan. And caramel. Oh, just everything. They’re absolutely perfect. Orrrrr five for me, one for you….JK That would be cruel. But seriously, these look out of this world. I used to hate bread pudding growing up but have developed such a love for it after making it at home with fresh ingredients! I would easily bathe in that sauce any day so sign me up for that bandwagon! Bread pudding is my spirit animal. This looks amazing. And the pecans? Yes. For some reason I can’t stop laughing at the “saucy on the bottom” part. It feels like there should be some kind of dirty joke in there but since the baby stole my brain I can’t come up with it. Either way, feed me. All the sauce, all the bread please! I love bread pudding and always feel so guilty when I make a full recipe…..I just can’t leave it alone. :) This way I can make a small batch and indulge myself. Ready to try this one right away. Merry Christmas!! Bread pudding is one of my favorite desserts, so you just knocked me out twice: making them miniature (!) and brown sugar whiskey caramel sauce (!!!). Beautiful! Bread Pudding is my favorite dessert, and mini versions just make everything more fun. Love the idea. I like that suggestion of three for you and three for me! Soooo yummy! This looks delicious Christina! Hope you had a wonderful christmas! I’m not sure, as I only test my recipes for two. If you double it and it works, please let us all know. Loved your recipe. It was so simple, did not require much that I did not already have, except the liquor, but managed to borrow from my neighbor, so that worked out, too. SOOOO delicious. Thank you for sharing. Hey girl, I was just wondering could you use the TEXAS size muffin tin and just make three instead of six? Just saying since I’m going to eat two at a time if I use the regular muffin size pan. I will rate it after I get your yay or nay, but only for the benefit of others, because all of your recipes come out so delicious! Have you ever doubled this recipe?? I am trying to make it for thanksgiving and I want to know if it will turn out crazy! I have doubled recipes a bunch, but I this one makes me nervous. I haven’t, but I’m sure it would be fine. I made this for a small gathering a couple of days ago and it was an absolute hit! Instead of the whiskey caramel sauce, I poured (or more like dumped) Balsamic Strawberry Sauce over it. My favourite part was they weren’t soggy inside and were super easy to serve! Thanks for the share! Can you freeze them? I’m going for a girls trip to the mountains with 10 friends. Would love to take these! Ummm…I’ve never done it, but I think so? Don’t freeze the sauce..make it right before serving. Thanks for sharing. Best bread pudding we have ever enjoyed! Used Brandy, because out of whiskey. Need the “for two” recipes, only 2 of us at home now! Thanks again! Do you think I could make these in ramekins instead of a muffin tin? Or would it be better to use the tin and turn them out on to a platter? I’m bringing them to a friend’s house for luncheon and she loves bread pudding, so I was considering presentation. Is your oven temperture in Fahrenheit or Celsius.